"This book enraptured me. Original. Breath-taking. Heart-breaking...in all the right ways. "-UtopYA Reviews"Talk about one crazy, complicated love triangle! Chelsea Fine sure knows how to pull heartstrings. At the end I yelled, 'Shut up! Ahhhhh! I seriously need the next book. RIGHT. NOW'. "-Goodreads Reviewer"The love triangle in this book is the best kind of triangle...one where everyone believes and everyone loves and everyone suffers! The end left me wide-eyed, open-mouthed and longing desperately for the next book! "-The Book HookupOVERVIEW:Three curses. Two brothers. One love triangle.Sometimes love is meant to be. But sometimes...love is the death of you.More praise..."Anew was so freaking good! The suspense, the passion, the chemistry, the love triangle, the fabulous writing, the best characters ever, the conclusion, (*deep breath*) OMG the conclusion...it was all WOW holy cow awesomeness. 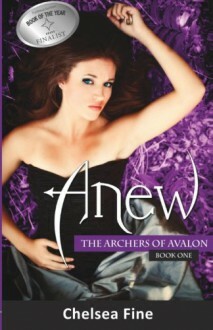 Anew was a completely original paranormal romance. "-Reading, Eating, Dreaming Reviews"Amazing, beautiful book! I liked the idea of the plot - it's fresh and unique, I loved the characters, the pacing of the story was perfect and the ending promising! Great style of writing and nice humor! Just perfect! A must-read!!! "-Goodreads ReviewerFans of The Vampire Diaries and Once Upon A Time will fall head over heels for the desperate characters and endless mysteries in Anew! Not at all what I thought it would be about. So much better! And THIS is why I'm glad I waited to read it until all 3 books were out. That cliff hanger would have killed me dead.